Wallpaper Removal is often a messy, frustrating task. Let Watson's Painting & Waterproofing Company remove your wall paper and your headaches! 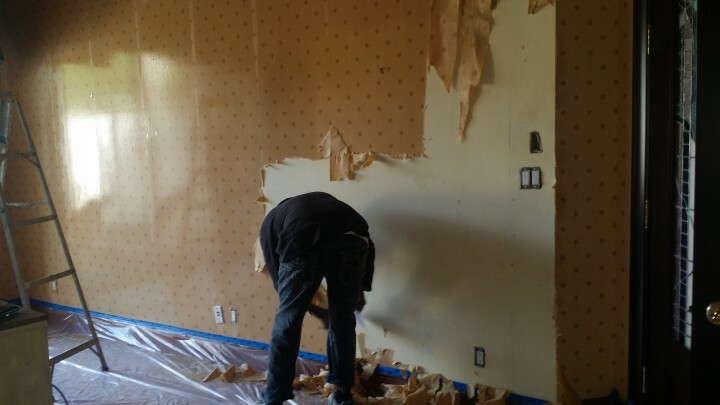 Watson's Painting & Waterproofing Company will carefully remove the wall paper as well as any remaining adhesive. Glue that is not fully removed can seep through a fresh coat of paint. We will then properly prepare your surface, filling in any imperfections before we paint. After a solid coat of primer, Watson's Painting & Waterproofing Company will make your walls look new again with a fresh coat of paint. Satisfaction Guaranteed - Watson's Painting & Waterproofing Company guarantees that you will be satisfied with your wallpaper removal. The job will be done to your specification and we go the extra mile to make sure you are happy you chose Watson's Painting & Waterproofing Company. Watson's Painting & Waterproofing Company is a leading provider of Wallpaper Removal services. Our expert wallpaper removers have years of experience and can make your wallpapered walls bare in no time, saving you hours, if not days, of tedious labor. When you are tired of that old wallpaper and ready for something new, give us a call. We will remove that outdated wallpaper quickly and easily and clean up the mess too!